A true performer in profiled roofs sheet with a touch of elegance and rigidity blended harmoniously. It remains one of the prefered and frequently specified roof types by architects and engineers in building projects. Product rigidity owning to interlocking ribs and a unique concealed clips fixing gives it a perpetual appeal. The dense profile with its high rib forms has excellent spanning capability reaching purline over greater distance exceeding 1800mm, hence allowing for more economical designs. The deep trough between ribs allows it to be laid at extremely level pitch without the risk of a leak or water spilling over side laps. Concealed clips fixing allows the profilesto be fixed easily by just pressing the sides onto clips until the roof catches on the bracket. It fits nicely with roof profiles and this ingenuity design has been tested to perform even under rigorous wind conditions generated in wind tunnels laboratories. Hence a safe load determined form the necessary conditions to sustain against roof pull outs due to wind uplift and suctions. 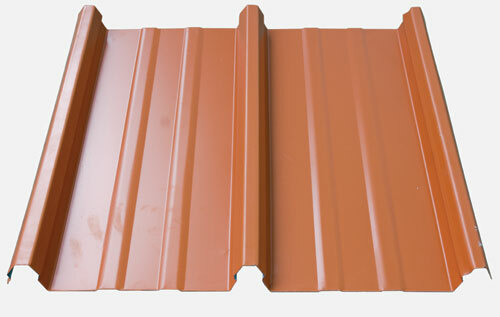 This roof profile is appropriate for buildong with large overall roof are such a warehouses, factories, office building or multipurpose halls. Start from positions furthest left or near the left edge, mark aligned positions then fixed Brackets/Clips with wafer head screw. Once clips fixing are fixed, start to install 1st roof sheet. Subsequently fixed next clip to position. Place next row of clips and ensure Short Return Leg strap over the Male Rib of the underlapping sheet. Once clips fixing are fixed, start to install 2nd roof sheet. Subsequently fixed next clip to position. Final sheet to be cut partly along roof length leaving remainder cut off. If cut off leaves a fully center rib then finish with flashing cover over the final sheet. If cut off leaves less than half the full width then fixed a half clip on the last side of the final sheet, finish off with a flashing cover. 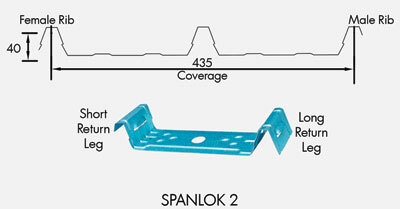 Steel support up to 2.5mm No. 10 - 16 x 16mm wafer head self drilling and tapping screw Increase to 22mm long screw. Steel support 2.5mm to 5mm No. 10 - 24 x 16mm wafer head self drilling and tapping screw Increase to 22mm long screw. Timber support No. 10 - 12 x 25mm wafer head type 17 self drilling screw Increase to 45mm long screw. Galvalume steel is a corrosion resistant Al-Zn Alloy coated steel produced by continuous hot dipping process. The alloy coating comprises of 55% Aluminium (Al), 43.4% Zinc (Zn) and 1.6% Silicon (Si) in good balance with Zn. Paint Hardness Scratching with Mitshubishi UNI Pencil No scratches when scratched with the pencil harder than 3H. Erichsen Scar, in check pattern, in 1mm interval with knife, extrude with Erichsen Tester, remove paint film using scotch test. No paint peel off. Bend 180 degree, OT Bend. No crack of paint. Du Pont Impact Drop 1kg of steel ball diameter ½" from 50cm height. No crack or flacking of paint film. 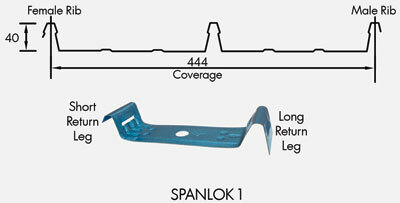 Lock Forming Form with Lock Form Tester. No noticeable cracking of paint. Solvent Resistance Rubbing on the pre-painted surface by using cotton soaked in MEK Solvent. (min. 60 times) No paint peel off. Salt Water Spray JIS Z 2371 Satisfy JIS Specification. Weathering Over 1,000 hours with Weather-O-Meter. No change. Copyright 2013 HSRM Sdn Bhd. All rights reserved.